T-Mobile has formally announced a pair of no-contract rate plans for customers today with their new unlimited Monthly4G plans that go as low as $50 per month. The two plans, which went into effect on May 22nd, provide consumers with unlimited Talk, unlimited Text and unlimited Web. Of course “unlimited” web in this case means you 4G speeds only up to a certain point. And that point depends on how much you wanna spend each month. Once you hit the wall, T-Mobile will throttle your data speeds. For $50/month, customers get unlimited talk, unlimited text and unlimited web with the first 100 MB of data at up to 4G speeds. For $70/month, customers get unlimited talk, unlimited text and unlimited web with the first 5 GB of data at up to 4G speeds. Also keep in mind that these 4G speeds will depend on your handset and the market(s) in which you use the service. 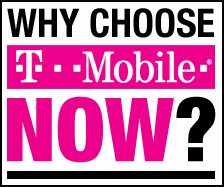 For more information, or a look at the coverage map, be sure to check out T-Mobile.com.